By integrating technology and intelligence into your transportation systems, I- Soft can improve services’ capacity and make the system more efficient and sustainable for future growth. Using real-time information regarding licensing procedures in addition to retrieving traffic records for evaluation and processing; I-SOFT has a leading edge and unique experience in ensuring high accuracy, flexibility, centralized connectivity to transport and police authorities and providing swift and accurate transactional processing in a wide range of vehicle and driving related services. Using big data processing and analytics capabilities to uncover insights that can improve transportation operations and planning. Furthermore, I-SOFT is equips operators with smart devices connected to its provided solutions to improve performance and agility. 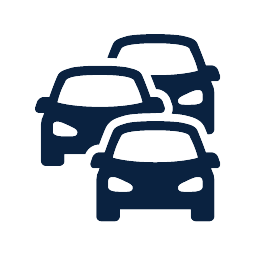 I-SOFT solutions for vehicle licensing and inspection track and manage over 1,800,000 vehicles yearly. Authorities that overlook fleets of vehicles and mobile employees need solutions that track, schedule, route, communicate and respond in real time. We offer large scale vehicle licensing and inspection management solutions that combine real-time GPS tracking, scheduling, back-office processing, and analytics to help you deliver high-quality, on-time service while reducing costs, improving performance and increasing customer relationships. I-SOFT solutions empower authorities of any size to optimize the management of under jurisdiction vehicles and drivers or mobile technicians with applications and hardware configured to their needs. We provide innovative and integrated onboard computing and mobile communications systems that enable managers to get data-driven business intelligence at their fingertips. Traffic Department: Dubai Police Traffic Department Applications including Vehicle Registration, Fines, Driving Test, Driver Licensing, Workflow, Internet and self-services and integration with other Dubai Police departments and other organizations. The project covered analysis, design, development, documentation, deployment & Data Migration. Road and Transport Authority: Licensing Agency, vehicle, Drivers and Fines management, commercial licensing, distinguished numbers and auctioning. Road and Transport Authority: Managed Services for Licensing Agency Applications including Vehicle Registration, Fines, Driving Test, Driver Licensing, Workflow, Internet and self-services and integration with other RTA Agencies and other organizations. Road and Transport Authority: Vehicles Inspection System.